On the 1st of November 1990, the first indoor supercross event ever held in Spain took place in Barcelona. 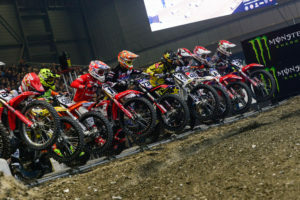 It was the first run of the Supercross de Barcelona, the first motorcycling event to take place in the “crown jewel” of all Barcelona pre-olympic and newly-inaugurated sport premises: the Palau Sant Jordi arena. Featuring one of the biggest budgets for the Barcelona-based sport events organizing company RPM-MKTG (in 1990 called RPM Exclusivas) since then, the challenge and the doubts -motocross racing was not very popular in Spain at all- were quite remarkable. 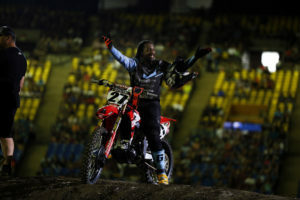 Success would only arrive by bringing to Barcelona the best supercross riders in the world -that is, the best in the US AMA Supercross championship, the world’s No.1 series. No sooner said than done. Around ten American riders -featuring #1 Rick Johnson- were in Barcelona for that very first run of the brand-new two-day event. The show was a huge success and the crowd enjoyed both the races on Saturday and Sunday afternoon and the styling contest on Sunday that closed the event with a final flourish. An amazing motorcycle racing event was born, and the city of Barcelona and its metropolitan area would highly enjoy the Supercross in the years to come. Since then and for 18 years and 19 event runs, all major Supercross stars have raced in Barcelona: Rick Johnson, Jeremy McGrath, Jean-Michel Bayle, Jeff Stanton, Stefan Everts, Ezra Lusk, Mike LaRocco, Marvin Musquin, Nick Wey and David Vuillemin, for instance. The arena was totally packed out one year after the other. Even sellouts forced hundreds of spectators to sideline in some events. 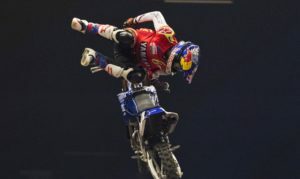 Elbow-to-elbow racing on short and thrilling races together with the stunning styling contest -germ of freestyle motocross- was a perfect combination able to provide three hours of non-stop action-packed motocross racing and amazing fun.